"The Legacy Comes Alive..." That is what it says on the back of the jewel case. I'm not sure what they mean by that. If legacy means original, then in this case it is true. 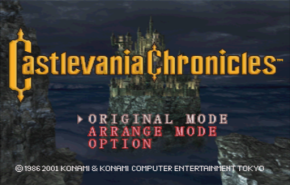 This is a remake/remix of the original NES Castlevania for the Playstation 1. It adds all new graphics, sound effects, and score. Only the gameplay and the levels have remained the same. 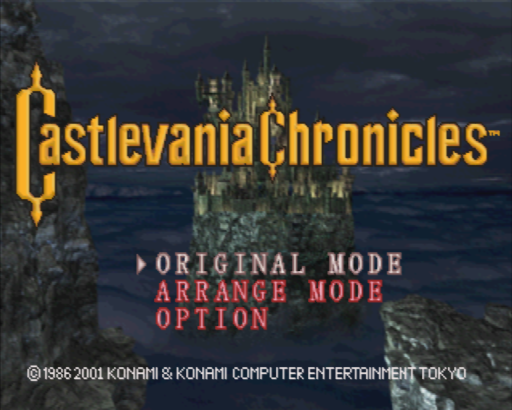 The game has two game modes, Original and Arrangement. The arrangment mode has even more tweaks and changes. I am always a fan of classic game remakes. Konami did a great job preserving the feel and style of the orignal, while pushing it to a new level. In an age where all new games were going 3D it's still good to see a company pusing 2D graphics to new levels. For an even better example of this, check out Castlevania: Symphony of the Night.